HESCO inspects cranes of all sizes throughout the North East. 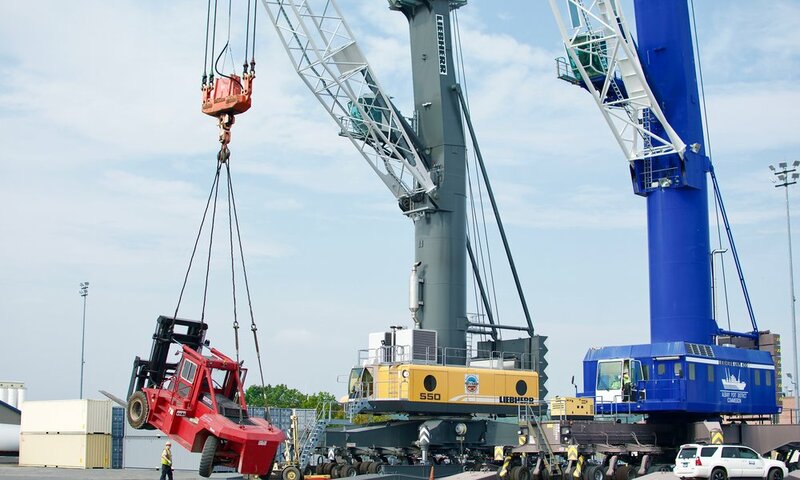 We inspect with the same precision whether they are smaller truck cranes like the carry-deck or the more massive devices such as Hydraulic Lattice Crawler or Portal Cranes. The current port was constructed in 1932 under the direction of Franklin D. Roosevelt during the Great Depression. At the time of its construction, it held the world record for the largest grain elevator Even though Mississippi has since stolen the title for largest grain elevator, Albany has been transformed into an incredible hub of industry and now owns the tallest harbor crane in the state of New York. The port has major rail connections and is conveniently located within close proximity to major interstates. Moreover, the port of Albany is located at a crucial point in the New York Canal System that adds more efficiencies to this transport hub. The port's two huge cranes are invaluable shore-based material handling devices that keep this port moving and our team is proud to inspect them. The two portal cranes are driving forces in New York's local and state economies. HESCO was happy to assist with the inspection of the monster Liebherr LR1250 Hydraulic Lattice Crawler Crane being used to construct the new Vassar Medical Pavilion in Poughkeepsie, NY. This heavy lifter had a capacity of 275 tonnes. According Walsh Construction, the new massive healthcare construction project will house a new 696,000 SF patient pavilion and include 264 private patient rooms, 30 critical care rooms, a 66-room emergency department, 12 surgical suites, and a 300-seat conference center. The half-billion dollar pavilion is considered to be the largest construction project in the history of the City of Poughkeepsie. The facility will also incorporate the latest in sustainable design and is expected to achieve LEED certification. We can’t wait to see the project progress and we are honored to be a part of Boston’s growth. HESCO loves seeing its home state's economy grow, creating more local jobs. We were proud to called on by Bay Crane to inspect the beautiful LR1400 that is helping with the construction of The SoNo Collection, South Norwalk's newest retail center. Norwalk's new attraction is scheduled to open in 2019. It will be Connecticut's fourth largest mall and will tap into shoppers from the state's largest and wealthiest county. The SoNo collection will feature southern Connecticut’s only Nordstrom and Bloomingdales, while providing several dining options, a sculpture and rooftop gardens.